Full screen mode is supported by majority of modern web browsers including Google Chrome, Mozilla Firefox and Microsoft’s Internet Explorer. Ideally you need to manually activate to use web browser in full screen mode. Unfotunately, there is no pre-defined option to keep full screen mode enabled all the time. However, there are few work-arounds that allow you to always open and use web browsers in full screen mode all the time. If you are using either of Internet Explorer or Firefox web browsers, then you can easily setup to always open them in full screen mode. There is nothing to edit or install for such functionality. 1. Just open web browser (either Internet Explorer or Firefox) in your computer. By default, it will open in normal browsing window. Press F11 key to switch to full screen mode. 2. Now close the web browser and open it again. It should open in Full screen mode by default. To disable full screen mode press F11 key again. Unfortunately, this method does not work in Google Chrome browser. Like other web browsers you can press F11 key to switch to full screen mode in Google Chrome browser. However, when you re-open Google Chrome browser it opens in default state and not in full screen mode. 1. You may use Kiosk mode to always open Google Chrome in full screen mode. 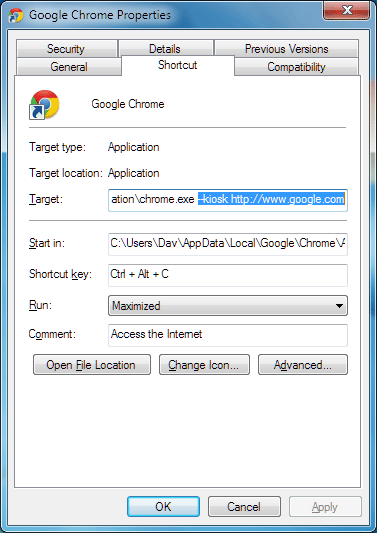 Goto Start and right click on Google Chrome icon and then click Properties option. 3. Click Apply and OK. Now click Google Chrome icon and it should open in a neat full screen mode. You can use Google Search box to browse to any website of your choice. You need to press Alt + F4 keys to close Google Chrome window in Kiosk full screen mode.